To learn the major differences (Midea WHS 129c1) when comparing two items of similar origin and utility, it is very important that one must have detail information regarding the characteristics of both the items. These may be any items/gadgets of utility, home use or even of usage outside the residents. This becomes more important and essential when the decision is to be made concerning electrical gadgets. In the present modern age of technology where the competition among different multinational companies, manufacturing gadgets / items that are to be used in the home by all the occupants including children is moving at very high scale, each claiming the capabilities of their gadgets better, safer and cheaper in use or in price than all others. Manufacturers of Freezers, Chest Freezers, and other similar cooling gadgets are not lacking behind in any way. Let us analyze what are the main features of all such cooling gadgets that are presently available in the market. This is a machine that is manufactured for use as a preservation gadget, that is, to protect eatable items from being wasted and to preserve them by freezing them for using them at a later time. These gadgets are manufactured in accordance with the requirements of the user, the bigger the requirement, bigger the size of the freezer. These gadgets are also based on the type of their usage, that is, commercial or domestic. Remember these gadgets are different from a Refrigerators. The freezer is required to freeze the items placed in them whereas the refrigerators are meant to keep cool the items placed in them. It is available in the market in many colors, but the white color remains in demand more than other colors. The Midea comes with a hanging wire basket, which covers around half of the interior of the freezer. This means that you can easily reach items that you use often, without having to dig through all of the rest of the contents. You can also sort foods this way if you want to bring some order to your freezer! Don’t want or need to use it? It is removable so you can take it out if you wish. The Midea WHS 129c1 is also designed for easy use and maintenance, with a wipe-clean interior and defrost drain fitted for simplicity when it’s time to defrost or clean out the freezer. It has an adjustable thermostat from -12°C to -28°C, as well as door hinges that stay open at 45 to 75° angles. In addition, the hinges on the door are reversible for ease of access if necessary, so you don’t have to worry if it will suit your home’s layout. As a freezer will always be plugged in, energy consumption is a very important factor in choosing your new freezer. The Midea has this factor covered, being very efficient in energy usage. It requires just 193 kWh and costs around $23 a year to run. This makes the Midea a smart choice for both operating on a tight budget and trying to keep your carbon footprint low. It is in fact amongst the most energy-efficient appliances in its class, so it is a top-of-the-range choice. We expect the machines that ease up our lives daily to be highly efficient, good to look at and somewhat free of mass. A freezer is definitely one of these unfortunate components from which we expect these three things. Especially, if you live in a small apartment, the size of a freezer might even hamper your free movement. Who wants that? The freezer should be what it is expected to be- a beautiful addition or an invisible labor. Midea WHS-129C1 Single Door Chest Freezer offers you all of beauty, efficiency and easy storage. Midea WHS-129C1 is a general purpose Freezer! Whether it’s for your small kitchen, bedroom, garage, the living room this freezer will certainly fit anywhere and look good nonetheless. Being 3.5 cubic feet in volume, it will save up space like no other freeze of equal capacity will. You may just get the cue to go and buy that chair you have been in doubt of buying to fill up the extra space left by this compact freezer. Moreover, with its sleek, simple design and plain white color, it will just blend in with any room décor. Now, beauty is nothing without brains. So, how efficient is this freezer? Just as efficient as you want it to be! It does its job of freezing quite well. You can keep everything you need to keep in it with its generous internal dimensions of 18 X 20 X 18 inches. Moreover, the wire basket it comes with will definitely make your life seem more convenient. When it comes to performance, it easily freezes a gallon of water in five hours with its temperature dial set to middle. So, you can adjust the dial anytime to get the output you need. Midea WHS 129C1 is quiet, safe and very functional! It makes no noise to make you doubt its stability and safety. You can welcome guests merrily into your kitchen just to let them know that your freeze shows signs of ever exploding. The reversible hinges on the door make it convenient for the usage by lefthanders also. You will also find its ability to open its door to a width of 45-75 degrees very generous. Midea assures the quality build of this freezer with its flawless reputation. Moreover, it gives you such a quality product at such an affordable price. Therefore, to put MideaWHS-129C1 Single Door Chest Freezer, in a nutshell, let’s take a look at its pros and cons. Takes up less space with its compact size. Sleek, simple and classy in design and color. Comes with a wire storage basket. Does not make any noise. Easy to defrost because of the built-in bottom drain. Comes with a two-year warranty. Frost builds up in around 5 days. But, wiping the frost off daily will prevent its build-up. It’s a bit heavy to move around but how often do we move a freeze? So, it’s evident that the pros outnumber the not-so cons. What are you waiting for now? Go grab that freezer! This is manufactured by the Midea company for freezing and storing food. The chest freezer is used to freeze foods. It has an extra space for storage. The freezer has a capacity of 3.5 cubic foot, ice, and drinks. Read here the Midea WHS-129C1 Review. It can be used to freeze up to 123 pounds of food. This will help you to organize the foods well. You can easily use it at home bars, garages, game rooms, man caves, and gyms. It is ideal for those who have limited space. The Single Door Chest Freezer – Midea WHS-129C1 is available now on the market. It has a robust Mechanical Control with Adjustable Thermostat from -12 to -28 Degrees. Midea WHS is great for Storing Frozen Food, Ice Cream, Ice, etc. It contains Hanging Wire Storage Basket. Its Hinge-Style Door Remains Open from 45 to 75 Degree Angles. External Product Dimensions is 33.5″ L x 22.2″ W x 20.59″ H. Company provides a warranty period of 1 year, compressor warranty is 2 hours. Midea Freezer is a high-quality product, easy to clean. It has sufficient storage, although fits in a small space. It has got all kinds of flexibility from a user’s perspective. The Midea WHS-129C1 is a high-quality home freezer that is very energy efficient and has a large capacity, suitable for families. It also has many design features that make it a strong candidate for a replacement or new freezer. To find the best price Midea WHS 129c1 click here. Read real customer Midea WHS-129C1 reviews. The Midea WHS-129C1 is a high-quality free-standing freezer. 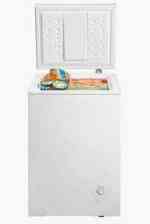 If you have the family of 3 to 4 people this chest freezer is the best choice for you! Midea WHS-129C1 is a single door chest, and it is ideal for people having small space in their home to be precise this product is a boon for small apartment holders as this unit takes very little space. It has a multifunctional role as it can double up as a side table also in a small apartment where the area is at a premium. It is pretty lightweight and comfortable to move around. It has an internal dimension of 18x20x18 inches which is quite spacious for a small freezer so that customers would be quite satisfied with the space provided in this unit. Usually, small appliances are not in continuous usage, so the power consumption aspect need not be worried about, as it is pretty negligible. But this is not in the cases of chest freezers, as these units need to be plugged in power regularly whole of the day and it drains out the energy. So this is one negative aspect and needs to be taken in to account where power consumption is an issue. Thus, customers who are money savvy and are worried about the cost of the power, they may not like this product. This unit is not free from frosting, i.e., it is not a frost free freezer. You can find the frost building up in the interior space over the time. You will have to wipe away the frost manually, but this can overcome by regulating the temperature. The hinges provided on the Midea WHS-129C1 are reversible, this would be particularly convenient where a customer may have some space which is not square or awkward so it can be adjusted accordingly by reversing the hinges. According to the specifications available, the Midea WHS-129C1 is approximately 60 lbs in weight, and it is a tad on the heavier side. This more substantial heavier side weight could make it more burdensome to move for ladies. There are no rollers visible on the bottom of this unit, so instead of rolling it around you will have to carry it around or pull it along the floor, and it could scratch the marble flooring. Read more about Midea WHS-129C1 News on the Midea WHS-129C1 product page and the Midea WHS-129C1 review page. Midea WHS-129c1 is a single door freezer.it measures 21.7 inches in width and 33.5inches in height having a capacity of 3.5 cubic feet. 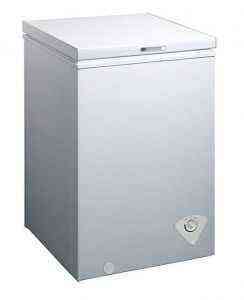 It is one of the most reliable freezers for 2 to 4 people. As mentioned it has the space of 3.5 cubic feet so it’s enough for 4 people more ever the biggest advantage of this freezer is its size. In the modern world, the size of anything matters and the size of this freezer is just suitable for small homes so there will be a lot of space free if you have this freezer. Read all about the Midea WHS-129C1 news here. Another thing interesting about this model is its size is small but it does not affect its cooling power it maintains the same cooling for which freezer is known so it is a kind of great package for those who need a small freezer with capacity enough to store the products. The design of this chest freezer is completely matching the requirements of normal peoples. It also has an adjustable thermostat between 12 and 28 degrees which gives a choice to set at according to your usage. If you need more cooling like if it is summer so you can set the thermostat on lowest degrees but in winter the weather seems cold so you can turn the thermostat to high it also makes the consumption of electricity less which will help to adjust your budget. Also, it keeps your product frozen up to the very long extent and it is the main thing which is necessary for the freezer and the cooling power of Midea WHS-129c1 is very superb. The door use in this chest freezer is amazing which will remain open from 45 to 75 degrees. This is helpful when someone is using the freezer and have to put something with which he/she cannot hold the door so all he/she has to do is to make the door on 45 to 75 degrees it will remain open until someone does not close it. It also has one hanging storage basket which makes more space it and you can store your products in that too. The Midea WHS-129C1 is a high-quality free-standing freezer. If you have the family of 3 to 4 people and looking for the freezer this chest freezer the best choice its reliable having low consumption of power having 3.5 cubic spaces. With good cooling effects. And its cost is also not too much high anyone can easily buy it. There are also some limitations in this model like its height is 33.5 inches a lot of people complained that it must be less but overall there is no big issue with Midea WHS-129c1. The customer who had purchased the Midea WHS-129C1 Single Door Chest Freezer is very satisfied with this product the way it performs is much satisfying. The demand for this chest freezer is increasing day by day because it is covering the requirements of a lot of people which make it more famous in public. As the saying goes, good things come in small packages. So do not let the size of the Midea WHS 129CI fool you. While this little chest freezer may look small, it easily fits into any room, but looks can be deceiving. With five cubic feet of storage space, this sturdy appliance has storage for all your food. This high-quality product keeps your food at a frosty -0.4oF to -13oF. Even with the lid fully open at 75o this appliance only stands 52” tall. Thanks to its sturdy base, this can also be used as a small table if need be and the smooth white and modern lines of its design allow this freezer to seamlessly blend in with its surroundings. In addition, it runs silently, allowing you to forget it is even present. So your mother-in-law will never notice. At less than 63 lbs, the freezer can quickly and easily be moved to another location if need be. The aluminium interior allows for easy cleanup. The manual defrosts setting and drains make sure that your food is the only thing taking up space. The good people at Midea will make sure that your freezer is delivered on time and in great condition. Stop battling with your over-sized, half-full giant chest freezer and experience a better way to freeze. People are already starting to understand the worth of this amazing freezer and no client has said anything negative about this product so far. Midea WHS 129C1 is for sure the best product and I’m sure that will be immense help to you. It really works well and you will hardly face any problems using it. Plus, the manual it comes with makes everything self so you won’t have to worry about problems. In spite of this, if you do face any sort of problem you can always contact the number and customer service will answer your questions. Are you worried about the cleaning side of things? Do not worry as cleaning this freezer is completely easy and stress-free. It is also very compact so it does not take more space to keep it. So, if you facing any sort of problem related to space I recommend this product. When you open this wonderful freezer you will be shocked to see that it is really spacious from inside. You can keep many things and that too without any sort of hassle. So, if you have already used it you will be fully satisfied. If you haven’t there is no reason to waste time. The product will be delivered in the packaging that will impress you a lot and you will always have good feedback about this Midea WHS 129C1 freezer. The best part is that you can also use it as a table by putting a small table cloth on it. It is for sure value for money as you will never mind paying for it. Its freezing performance is really good and thus it has become hot favourite choice among many people. Place your order and you will be fully satisfied. Are you a customer looking for a single door chest freezer? Midea WHS-129C1 is the ideal product to buy. At least, it is in my opinion anyway but I’m sure you will agree with me when you use it yourself. Its color is white and volume 3.5 cubic feet. Midea WHS-129C1 is rated as the highest selling single door product and it’s easy to see why. Midea WHS-129C1 is ideal for people with limited space in their home. 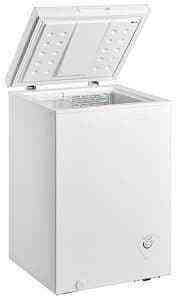 Even better, you can purchase this chest freezer online. There are many benefits. First of all, this chest freezer offers ten to fifteen percent extra storage space, in comparison to an upright freezer. Also, this product can be used for storing for a long duration. You will also find that this chest freezer consumes less energy. So your electricity bill will be less than $25 per annum. Finally, this product’s seal is tight, hence, offering food safety. Midea WHS 129C1 contains a wire basket for easy storage and stored food can easily be accessed at the bottom. This product also features an adjustable thermostat and its lid hinges are also reversible. This helps in installing the freezer for your convenience. Even if you are left-handed, you won’t have any difficulties with this freezer. Food, in this Midea WHS 129C1 chest freezer, is stored efficiently. You are not required to make an extra payment for unnecessary additions. This chest freezer is cost effective and easy to operate. Since it is energy efficient, it will work efficiently throughout the year. Another great advantage is the user-friendly design and controls of Midea WHS 129C1. But like with most freezers, you will have to defrost it manually. A great benefit is that the product does not require much maintenance. Hence, you will save service costs. So it’s no surprise people rate this single door chest freezer highly. It is an ideal one because of its reliability and compactness. Overall, Midea WHS-129C1 is a cheap, dependable, and energy efficient freezer. This is the answer to solve all your food storage. If you are really interested in buying a freezer, I recommend this one. One should look out for various options in the market based on what suits your needs. So, if you are looking for the one that is compact then there are many options available. All I know is that nothing compares to the Midea WHS 129C1 Single Door Chest Freezer. Anyone who is interested in knowing the features should surely read the information on the website as well. You will be able to clear all your doubts when you open the site. Still, if there is any question that is bothering you, you can always ask the same. You will get an answer to all your questions and you will never want to buy any other freezer once you read the specifications. Those who are looking for the compact freezer, this is just the right choice for them. There are many who have already placed the order and there are many who will place an order very soon after they are aware of the features of this amazing freezer. The best part is that it also offers you one full year warranty and in terms of compressor you will get two years warranty. If your home is not spacious this is one such freezer that will fit anywhere. This freezer doesn’t require much space. You can also use this freezer as a table if you want. All you need to do is buy a small tablecloth, place it over the freezer and you have yourself a table. One of the best things is that this freezer is a great price in comparison to its amazing features. Try to suggest this to your friends also if they are also interested in buying a good freezer with great benefits. The most important part is that cleaning is also quite simple and you can complete cleaning it within few minutes only. If you are lucky enough you might even get is at a lower price and this would only be possible during a sale. So, if you are willing to save money try to buy it when there is a sale. Many people place an order during a sale and this is the sensible way to buy it. You can buy it for your home as well as office and you will surely be happy after you see the performance. If you compare the price and the features, you will be happy to buy it. Try to make it a part of your home or office and it will surely make your life easier. 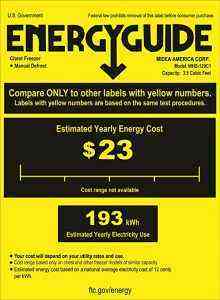 It does not waste more energy so it ranks highly when it comes to energy saving. You will love this product. If you are worried that electricity outages might have adverse effects on your refrigerators, you no longer need to worry. The freezer I am telling you about is the best in the market. Firstly, it has the capacity to preserve things for twenty-four hours without electricity. Secondly, its single door is easy to handle. It can also be used conveniently and is completely hassle-free. Plus, there is no issue of capacity in this chest freezer as it is 3.5 cubic feet size and is sufficient to cater to the needs of any family. In this damp and sometimes extremely hot season when there is a danger of ordinary refrigerator stop working, this chest freezer works really well. It really is an amazing freezer. Want to buy one freezer that is durable and affordable? 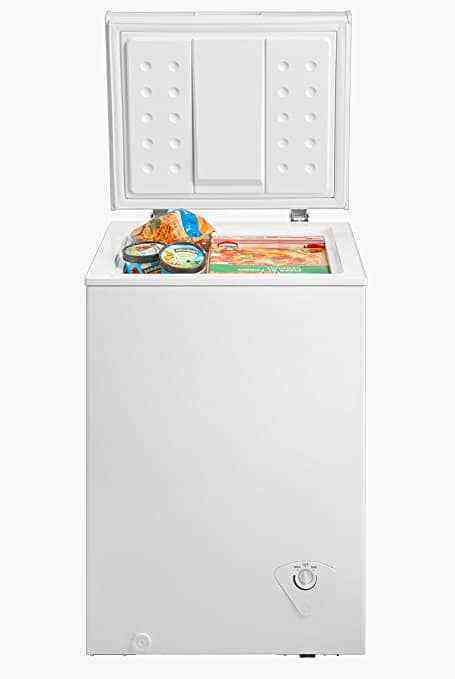 Believe me, this white chest freezer has the capacity of 3.5 cubic feet and is meant for you. Your family will love you to have it, your friends will envy your acquisition and your kids will cherish this treasure. Not only is it durable, spacious and beautiful, this chest freezer is also affordable. The good news is, there is no need to replace it as it seldom gets out of order. It functions smoothly and its modern technology keeps the things inside cool. Sometimes when loaded shedding tends to get on your nerves and there are constant fluctuations of electricity you tend to get intimidated by your electrical gadgets. However, by bringing in this product you will also buy yourself peace of mind. And thanks to its inbuilt mechanism, it helps it survive outrageous electrical outages. In today’s world when the market is very competitive and everyone is advertising their products, finding a good, affordable and reliable product becomes a real hassle. That’s because there is so much choice out there and very little guidance about the product. This product, however, is an exception. Its appearance speaks volumes about its quality. By having only one glance at this beautiful white chest freezer, you will be enchanted. This product imparts durability and beauty, simplicity and elegance. It manifests trust that you can bestow upon its functioning. It is about functioning smoothly and never causing any trouble to its users. The customers appreciate it very much. It is also heat resistant and can bear the worst weathers. I have seldom any complaints regarding its failure and malfunctioning. A great freezer for storing frozen food, ice cream, ice and your other delicious food items. No need for a table in your room as it can be easily used as a table to keep your extra stuff in an organized manner. 33.5″ L x 22.2″ W x 20.59″ H. Not a problem for even a small apartment to fit into. It can be easily kept in a corner; will not disturb your kids’ movement in your house. Do you have to hold the door of the freezer to take the stuff out? No worries now. This product keeps the door open between 45 degrees to 75 degrees. You can take your time to keep the stuff inside it or take the stuff out of it. the gasket is removable as well. Although a great quality product; but still in worst case if you may need it is a 1-year warranty for the entire product and 2-year warranty for a compressor. A great product from experts for the families who loves eating. Just go for it and enjoy your delicious food! Finding a chest freezer that will perfectly fit my small space has been a challenge to me. It is because there are many options that seem to meet my standards and preferences. However, I came across Midea WHS 129C1 on the internet and take a close look at its specs and features. can fit perfectly in a small space. There is also a removable basket included which I use for keeping and organizing foods. I have read other details about it and I can say I’m truly impressed. More than these benefits I have personally observed, this chest freezer unit has been delivered right to my doorsteps in time and in good condition. This is a practical choice for those who have a limited space at home or in their apartment. I like the way it has been designed as it is perfect for a home’s interior design. Since it is easy to clean, it gives no hassle or worries each time I use Midea WHS 129C1. It was only when I had bought a piece of land in a remote part of East Africa and there was a small cabin in it. It looked old but beautiful from the inside. Due to intense heat, I soon realized that a small freezer. A freeze which would not swallow all my borrowed space. Midea WHS 129c1 is what I found online. It was perfect for my needs. I ordered it immediately and as soon as it arrived I fell in love with it. It had a single door, 3.5 Cubic Feet, and white in color. I can confess that I stumbled on a quality product because it works well; it has the ability to regulate itself automatically beside being very quiet. I hate freezer fan noises during my sleep, you know. It fit well with a small space in the corner of my cabin and even though it is small, the compartments are easier to clean than other large freezers with large compartments. What made me happy the most is that even with the long shipping, my Midea WHS 129C1 was delivered in good condition! Besides, it had a manual on how to install and operate. This made it easier to use. At first, I thought it would have tiny space for my needs but I realized that it was customized for small space use. No sooner had I completed my order than it was delivered. I am light, small and has a stable platform on top of it. This made it unnecessary for me to buy a table hence saving more space in my cabin.